A client recently emailed me to ask me about a dress that she had. She wanted to wear it for her wedding, but the petticoat needed to have fabric added to it, and the other dress needed a bit of mending. 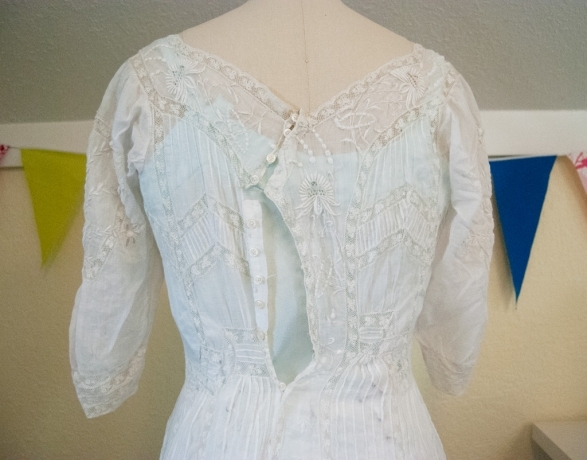 She said that they were antique pieces and I was intrigued, so I met her at the shop and looked over her dress. I was so excited by what I saw! 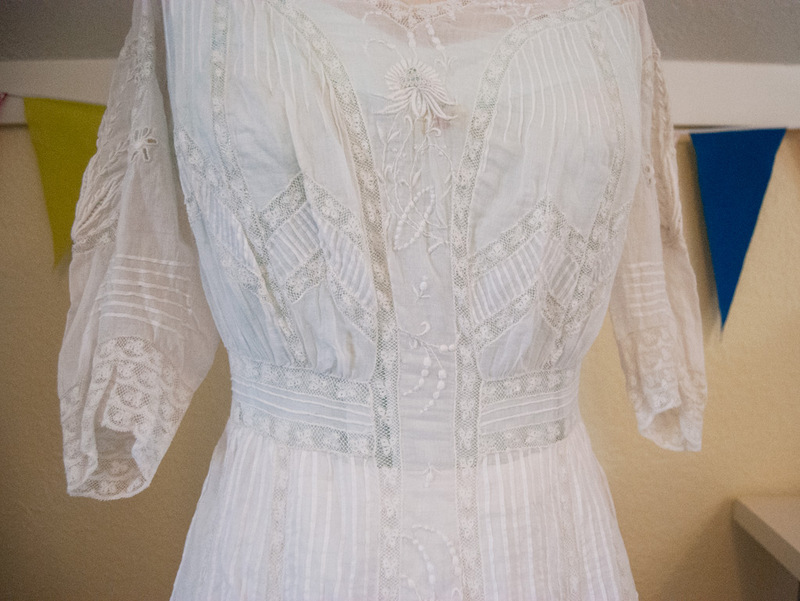 Her (wedding) gown was a stunning example of Edwardian fashion. It was a hand-sewn white cotton batiste dress with lace insets, pintucks and lots of delicate hand embroidery. The dress fit her like a glove! 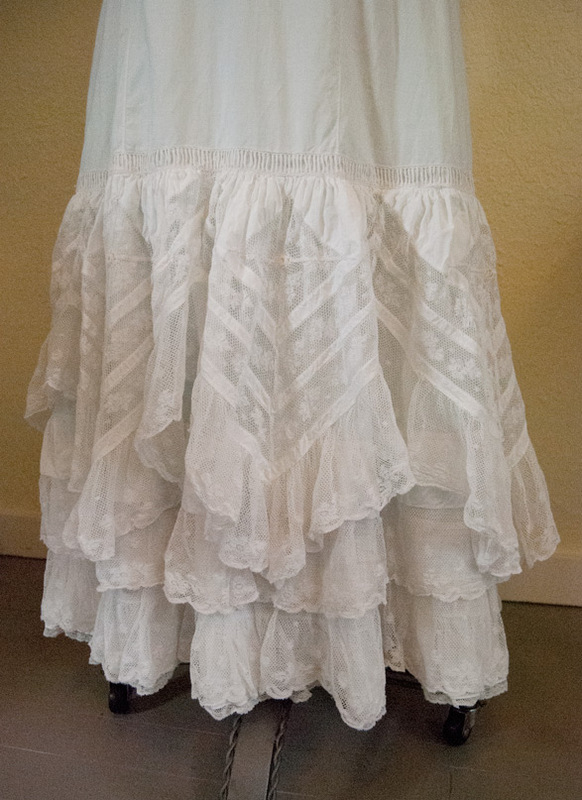 The petticoat that she intended to wear under the dress had an extremely tiny waist, so it was decided that I would add in a section of fabric with a zipper that could be removed later, if necessary, to maintain the original garment. We also decided that I would make her a slip from a silvery-blue satin, from a Mrs. Depew Vintage 1930s French lingerie pattern. 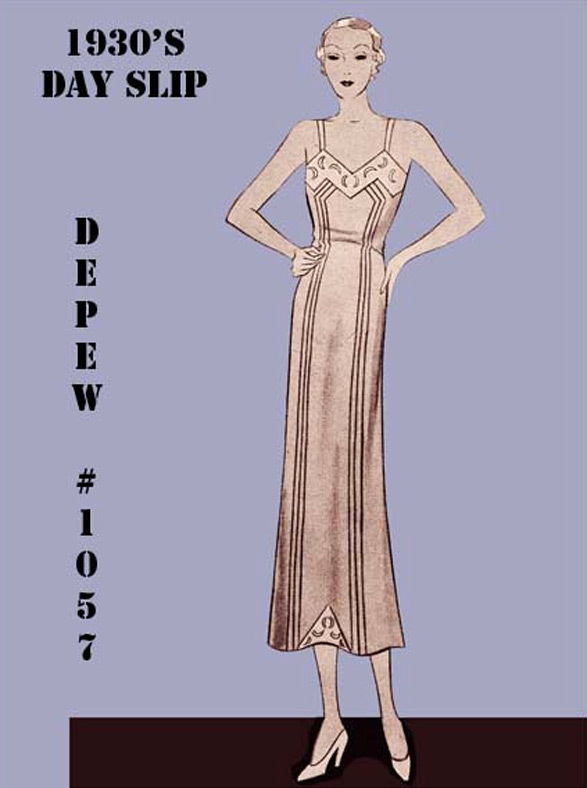 I had never before used one of Mrs. Depew’s patterns, even though I have one that I purchased for my personal use waiting for me in my pattern box. It was very interesting to draft, and I had a lot of fun with it. I would absolutely buy another one! You start off with a tiny piece of paper that has miniature pattern pieces on it. 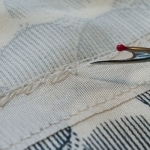 To make the pattern pieces in your size, you use a set of rulers. 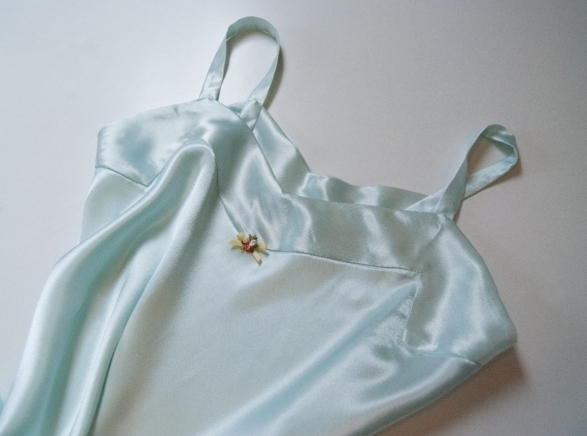 To read about the process, check out Anna’s post here: Draft At-Home Patterns. It was a fascinating process, and I loved that there was no size limitation on the pattern. The slip turned out beautifully. 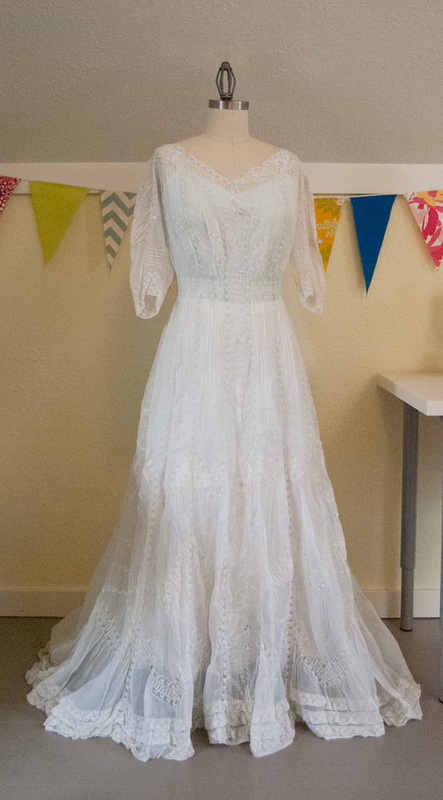 We ended up deciding to remove the ribbon and rosette, because they distracted from the lace pattern and it looked like a stain on the middle of the dress from far away. 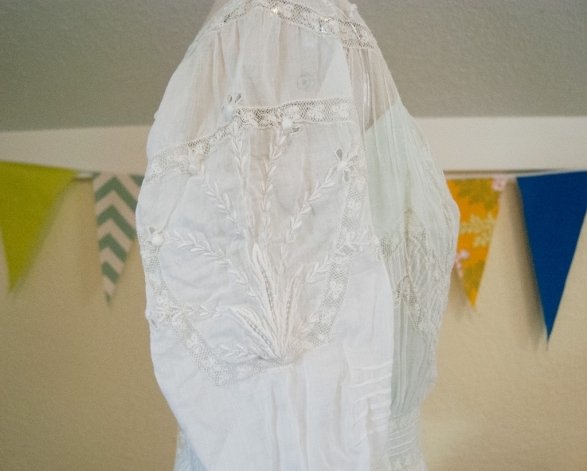 She decided that after her wedding, she would wear only the slip and the petticoat, to better preserve the outer lace dress. Before I washed the petticoat and dress, I thought that a few pieces of the embroidery were a dark peach color. Umm… yeah, it turns out they were light yellow. I didn’t realize how dirty the garments were, because they were so much whiter after a good soak and some sunshine! The star of this dress though is nothing short of amazing. The amount of time and detail that went into this dress… I can’t even imagine trying to guess how many hours it took to make. As it turns out, it once belonged to the Schlitz beer heiress. My client’s mother bought the dress at an estate sale in the 1980s. Did I already mention all of the handwork on this piece? I stared at it for the longest time, trying to find any trace of where a knot was tied off, or to discover some small secrets about its construction. Every yard of lace and and cotton had been pieced by hand. Every pintuck required dozens of stitches, and the couched embroidery? I don’t even know where to begin. The back had very interesting piecing. In order for the dress to have uninterrupted center back panel full of embroidery, the buttons and hooks that close the dress came down at and angle and then fell to one side of the center back panel. If you look closely, you can see the hooks and eyes hanging inside the cotton, where there is a fabric band that wraps around the waist. You can click on all of these photos to get a better view, by the way. 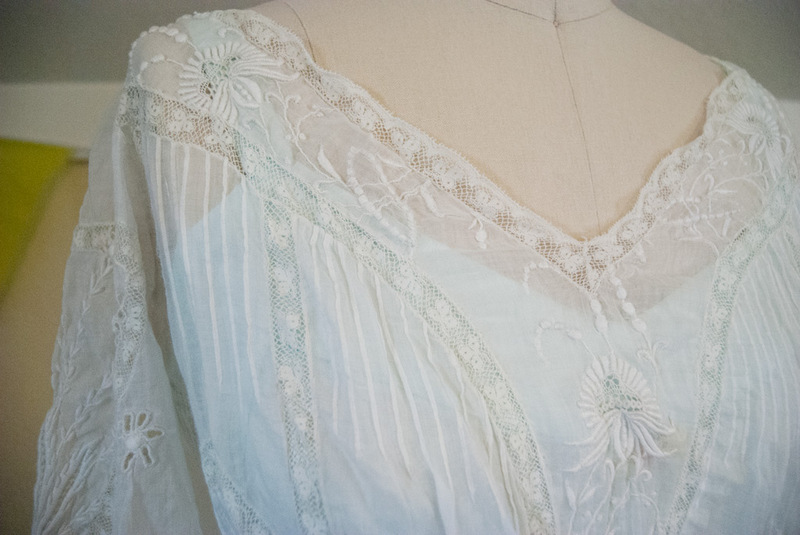 The sleeves had a beautiful forward slant, held at the elbow by more pintucks. Just extraordinary! How do you feel about garments like this? Does it make you want to work that much harder on putting details into your clothes? It sure does for me! This entry was posted in Patternmaking, Projects and tagged clothing, embroidery, inspiration, patterns, sewing, vintage on September 25, 2013 by Amy Alan. Is there a chance the lady can post a pic of herself in it? Breathtaking. I’m not sure, but I can ask her. It fits her so perfectly! Oh. My. Goodness. What a work of art. My grandmother could do this kind of work, but the few pieces I have of her work don’t come anywhere near the quality of this. I do treasure them though. It really is an amazing piece. I hope that she has it cleaned and well preserved after her wedding to make sure that others can enjoy it in the future. How lucky you are to own a few pieces that your grandmother made. Oh, how lovely! It is a work of art. It truly is. All I could do was marvel at how much time and effort would have gone into making such a piece. I love old garments too. It’s really hard for me to pass up buying them when I see them for sale at antique stores, but I simply do not have the room to properly store them. 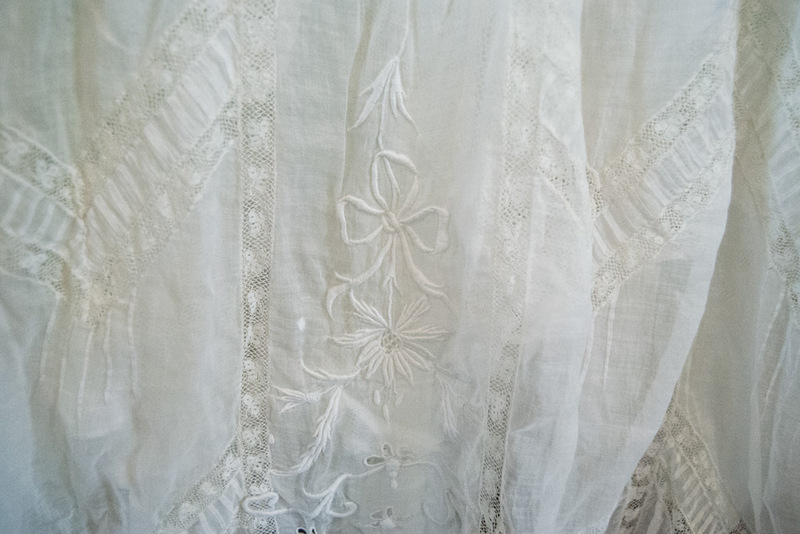 Do you own any of the garments that your grandmother made? You’re welcome! I’m glad that I was able to get a few before I had to give the dress back to her. 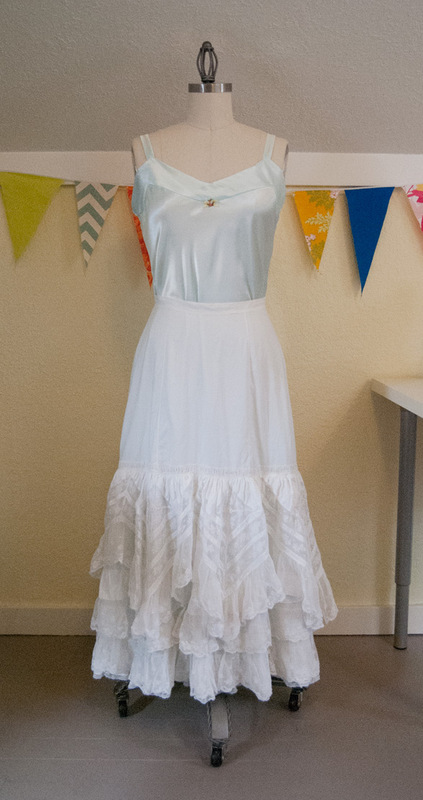 Thanks for sharing pictures of this beautiful dress, Amy. I too would love to see a picture of your client in the dress. Of course! I always love to share beautiful pieces when I can. I will see about getting a photo of her in the dress to share. Oh I love vintage fashion, beautiful dress! Meee tooo! I’m so happy she chose me to work on it. This is unbelievably beautiful! I too am seriously wow-ed by this level of craftsmanship, and yes it does make me look for ways to bring fine detail into my sewing. Thanks so much for showing this. I honestly could hardly get any other work done because I just wanted to pour over the dress and stare at it all the time. I kept trying to share the dress details with my husband, but he isn’t quite as passionate about these things as I am. 😉 I knew I had to snap a few photos to share- it was just too amazing! And I agree- garments like this make me want to step up my game and include more details in my sewing. THIS IS EXQUISITE!! I’m staring at it with my mouth wide open. (And yes, I am not a codfish!)! Whoever made this was trained very, very well. The meaning behind a garment like this has no words except: L-O-V-E. I know! I would absolutely love to know more about the history of the dress. Who made, how they made, how much time was spend on it…. it to take sooo long to do! The tiny hand stitches are impeccable. I wonder if it wasn’t couture. Older post: A New FREE Online Class!